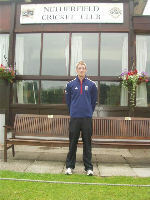 Matthew Clinton, Netherfield's 2nd XI bowler has been selected for the England Deaf Squad for the Deaf Cricket World Cup in New Zealand at the end of this year. "He will become the second cricketer from Netherfield to play for England following in David Billington's footsteps," said Ian Heath, the Netherfield secretary. "David scored a century for English Schools U15 almost 30 years ago before joining Leicestershire. "Mat certainly won't score a century but let's hope he gets a five wicket haul." The 2009 Deaf Cricket World Cup will be staged over two weeks beginning 28 December 2009 at Auckland's Waikaraka Park, and involves host country New Zealand competing against Australia, England, Pakistan, Sri Lanka, South Africa, Bangladesh and current Deaf Cricket world champions, India. Participants are required to have a qualifying total hearing loss of more than 55 decibels in both ears, and be a qualifying playing member of a cricket club affiliated to their national body. Clinton made his Netherfield 2nd XI debut in 2004 and this season has taken 14 wickets at an average of 14.43.